It has been estimated the American Chestnut tree once numbered over 3 billion. It was an important tree in the eastern forests of North America. It could reach over 150 feet tall and 10 feet in diameter, and it was prized for its tasty nuts and the rot-resistant wood. 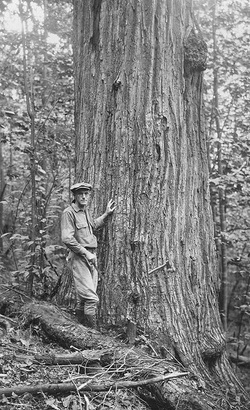 Twenty-five percent of all trees in the Appalachian Mountains were American Chestnut trees. In the early 1900’s a blight swept through the forests of the East, and now there are few large chestnut trees left there, mostly shoots and saplings that struggle before the blight finally extinguishes them. The great chestnut forest exists no more. The Carolina Parakeet lived in the forests of Eastern United States. The beautiful bird was mostly green with a yellow head and orange cheeks. The noisy emerald flocks sometimes raided agricultural fruits and grains. This, along with man’s destruction of its native forests, may have been its undoing. It was considered extinct by the 1930’s. These beautiful birds could once be seen in vast, colorful flocks, but now they are no more. In the 1800’s there were over 4 billion passenger pigeons--some say 5 billion, others say even more. By these estimates, forty percent of all the birds at that time in North America were passenger pigeons, perhaps the most numerous bird to ever exist on earth. Let me say that again: Perhaps the most numerous bird to ever exist on earth! They were hunted relentlessly, and their habitat was destroyed for man’s use. These were not the fat pigeons you see in the city parks--these were wild, sleek, fast, flyers. There are locations all over Eastern America named for these birds: Pigeon Forge (Dollywood is here), Pigeon Roost, Little Pigeon River--now you know where the strange names originated. People of that time would have never believed the birds would someday be absent from the sky. Many today don’t even know they ever existed. The last birds died in the early 1900’s. 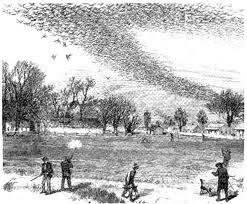 Martha was the last passenger pigeon in captivity to die. She passed away at the Cincinnati Zoo in 1914. They once blackened the sky like dark clouds--now they are no more--they are no more. You will see all of these come back to life in the novel, Chase The Wild Pigeons.